Posted the 15th day of January in 2010 by Riley. 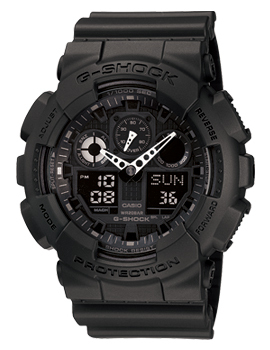 Casio has officially announced the GA-100 series of G-Shocks. This new line of analog/digital models features the GA-100-1A4DR, GA-100-1A1DR and GA-100A-7ADR. There's also two other versions not shown here, there's a third black one and also a yellow one. These watches seem to contain a totally new module that has a different look than anything Casio has released in the past. They offer a new twist on the traditional "Three Eye" design. 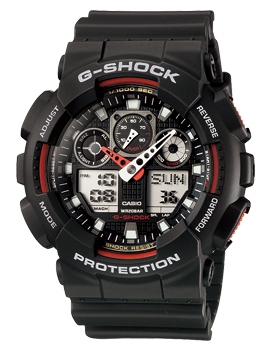 These new G-Shock watches boast a variety of functions including a 1/1000-second stopwatch, a velocity indicator, and magnetic resistance compliant with the International Organization for Standardization (ISO). Sure and solid operation is enhanced by over-sized buttons with anti-slip finish, and a large face with easy-to-read displays for viewing the results of important measurements. In addition to the main hour and minute hands, the watches display setting functions and speeds on LCDs at the 2 o’clock and 10 o’clock positions and on the analog dial with a small hand at the 12 o’clock position. The dynamic symmetric design of the GA-100/100A models is enhanced by two square LCDs at the 4 o’clock and 8 o’clock positions that display measured times, a calendar, world time and other functions. Beveled-edge dials and 12 raised hour markers provide a three-dimensional depth for bold styling, while rivet-like protrusions on the center right and left of the bezel as well as on the watchband embody G-Shock toughness. 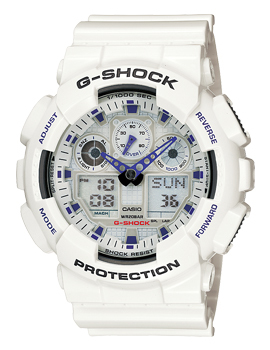 Cant to wait to get this watch.